Assalamualaikum dear worldwide compatriots of East Turkistan who live in exile! 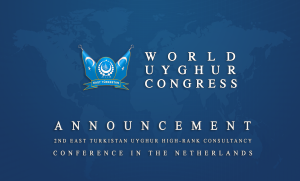 During a telephone conference chaired by our leader Rabiya Kadeer on 3 May 2017 with the members of an extended Committee of the World Uyghur Congress, we decided to held “The Second East Turkistan Uyghur High-Rank Consultancy” Conference in Amsterdam, Holland at the end of July 2017. 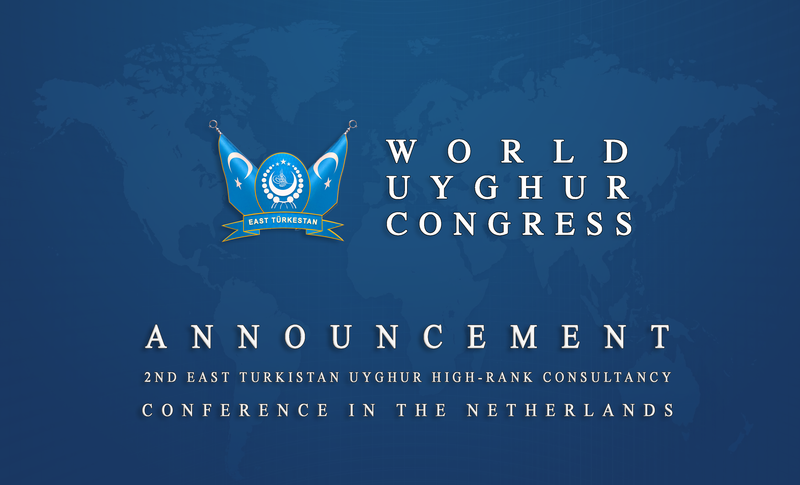 In order to successfully open the conference, we will establish an organizing committee for “The Second East Turkistan Uyghur High-Rank Consultancy” Conference, under the direct leadership of Rabiya Kadeer. The candidates for conference participation must be elected by East Turkistan Community members (or organizations) from countries or cities where the representative lives, they must be respected and able to represent their whole community. Candidates for the conference must be individuals who have the following careers, duties or titles: business people or well known public figures; representatives of women and young people; Uyghur academics and senior intellectuals; religious clerics and religious public figures; leaders of an organization or representatives of the World Uyghur Congress in a country where East Turkistan community members live; any other leaders or people responsible for an organization. We will also invite leaders of international human rights organizations; Turk – Islam organization leaders, international embassies in Holland; academics and experts who study Uyghur issues, and international media and journalists. We will not leave out any organization working on East Turkistan issues. Dear compatriots, at this decisive moment when the Chinese government is aggressively pursuing fascist state terror against the Uyghur people, and the land of East Turkistan is filled with great suppression and mourning, and the Uyghur people’s human rights are continually and severely being abused in a way never before seen in our history, when the whole country is shaken by this grave oppression, and blood is dropping from people’s eyes instead of tears, when the Chinese Communist government has labeled the whole Uyghur nation as an “enemy” of the state, when Uyghurs are constantly abused across China by both Chinese police and ordinary Han Chinese people, when the state systematically allows arbitrary arrests, detention, torture and executions of Uyghur people under the false slogan of the so-called “war on extremism”, when the Chinese government has declared a war aimed to destroy the ethnic, cultural and religious existence of the Uyghur people; under such severe circumstances, the call for “The Second East Turkistan Uyghur High-Rank Consultancy” Conference will be one of the great turning points in the Uyghur political movement. As well as countering the Chinese government’s “Great People’s War” against the Uyghur nation, we want to draw a new strategic road map. Regardless of difficulties, we are determined to continue our campaign calling on the international community to wake up to the Chinese atrocities. We want to show these countries and organizations including the UN, the US, the European Parliament, the Islamic World, Turkey and Japan, Islamic cooperation organizations, journalists, Human Rights organizations, and researchers that they have undeniable responsibilities for the ongoing massacres and abuses carried out by the Chinese government against the Uyghur people. In these worsening circumstances, we want to remind countries that they are receiving economic benefits from China for their silence on Uyghur oppression, and encourage them to change their stance. We want to point out that countries should be aware of the extreme policies pursued by the Chinese government in the domestic sphere. Because democratic countries are cooperating with and receiving economic benefits from China, they are avoiding criticism and allowing China to continue abusing the rights of the Uyghurs. As well as going through all these points, we also look forward to searching for possible solutions. • How do we solve our national destiny? • How do we save our country? • How do we save our people? • How can we provide assistance to our people in an emergency situation if there is widespread conflict in our country? • How do we implement the future strategy for our national struggle? • What path is most beneficial for our national movement? • What are the essential campaigns for us at the moment to pursue at home and abroad? • How do we solve disagreements between our organizations that hold different political opinions? • How do we encourage cooperate between organizations and political leaders? • How do we strengthen our internal and external publicity work? • How do we solve our financial problems? • How do we defend ourselves from internal and external attack? • How do we organize a unified “World Uyghur Youth Union”? • What else can we do to preserve national identity within exiled Uyghur migrant communities? • How can we resist Chinese government infiltration and sowing division with the aim of slowly eliminating Uyghur political organizations and their activities? • Are there ways that we can assist in cases of crisis for Uyghur refugees and migrants? During “The Second East Turkistan Uyghur High-Rank Consultancy” Conference, we will have extended discussions regarding the issues listed above in order to draw up a new strategic road map that suits the reality of our country. Through this consultancy conference, we will all come together to find answer to our questions. We will be determined to leave behind our ideological differences, try to end our internal frictions, and strengthen our unity. Our prime mission should be designing a direction for East Turkistan. Finally I hope that all East Turkistani people will show particular interest, and regard participating in this international consultancy conference as a major national obligation.